Row after vertiginous row of turmeric and masala-vermillion toned, ready-to-eat chaat boxes in all varieties and orders can only have so much bearing on the fresh-off-the-AirIndia-league of desis. After a while, the yearning kicks in and they hanker after the new, fashionable fleet of the Nostalgic NRIs. In this club, thoughts of newspaper cones filled sloppily with spiced nibbles of churmuri are oohed and aahed over, and moments spent trying to master the art of mouthing a gol gappa off a street-side chaat-waala in its entirety, only to realize, when the juice trickled down one’s chin, that it’s futile, are laughed over with childlike sprightliness. Recipes for intense, punch-packed green chutneys and masalas are exchanged animatedly, and the syrupy thickness of the sweet-sour tamarind sauce is debated by self-proclaimed experts on cultural variants. The toppings have their compartmentalized adherents unto their own merits — the sev lovers, the salad groupies, or even the yoghurt nuts. Chaat potlucks are geared up for, samosas smacked with fervor, kachoris cut up coolly, packs of puris and cans of chickpeas opened up, masalas mixed and relishes rustled..and after long spells of devoted enjoyment, newer pastures are sought. 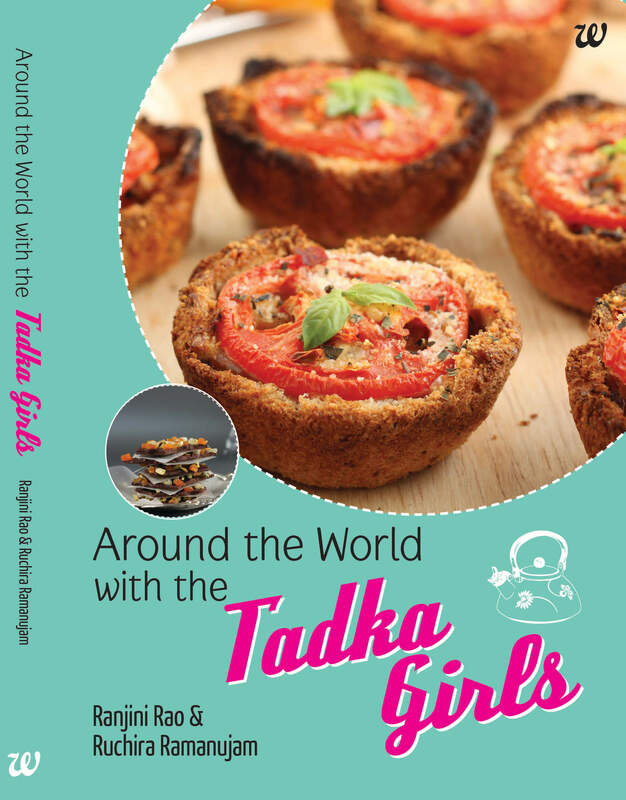 The prospect of tortillas fried up and used as crunchy beds for papdi chaat is as thrilling as dunking chunks of sour dough bread in saucy chutneys, or using rice crispies or corn puffs in the place of puffed rice. 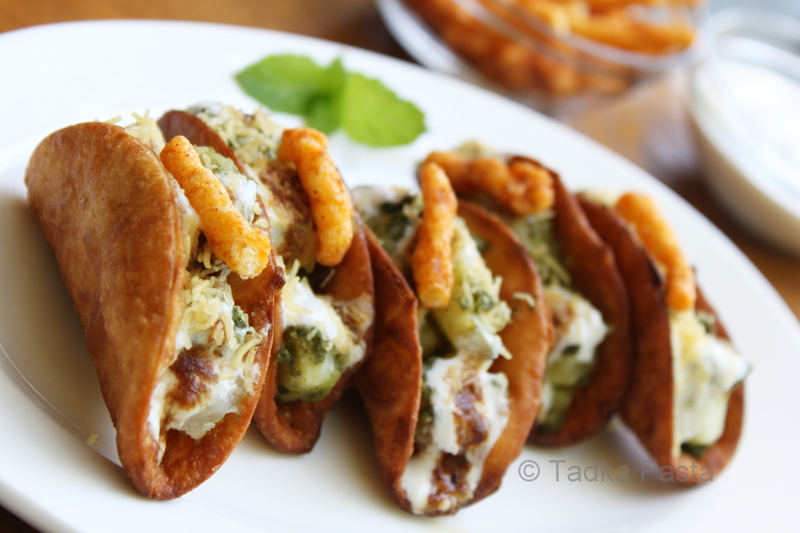 To that and the hordes of chaat lovers, the customary newspaper cone and the prized, peppery pani, we toast our tactfully treated Taco Chaat..
From each tortilla, cut out two 3″ circles using a cookie cutter or sharp-edged metal bowl. Prick the circles all over on both sides to keep them from puffing up while frying. Fold the cutouts over, keeping them in place with a fork while you heat up about an inch of oil for deep frying. Place a folded tortilla gently in the oil and keep it folded with a fork or ladle while the bottom crisps up. 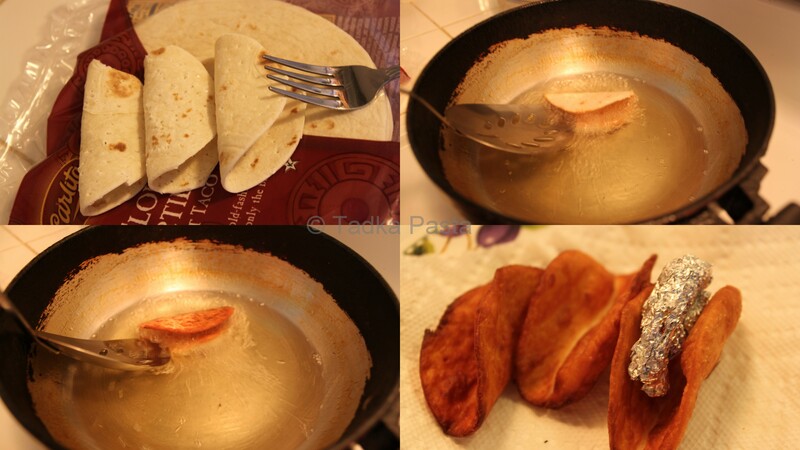 Once the bottom is brown, turn the tortilla over and fry the other side. Drain on a paper towel, using a wad of foil to help keep the taco shape. Repeat with the remaining tortillas, one at a time. These can be fried ahead of time and stored in a zip top baggie. Boil the potatoes until fork tender. Peel, dice and mix the hot potatoes with the green chutney, add the chaat masala. Whisk the yogurt with the spices. 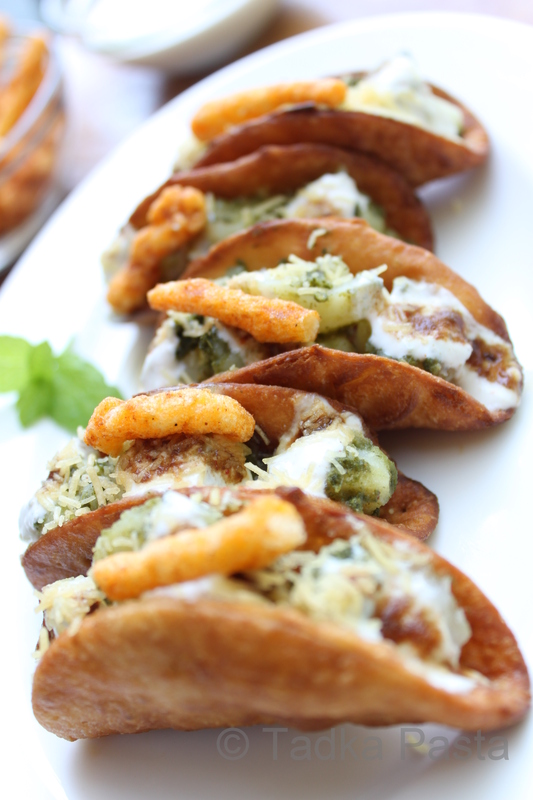 To serve, stuff each taco with some of the potatoes, top with a dollop each of the spiced yoghurt and tamarind chutney. Sprinkle the sev on top and add a crunchy Kurkure/Cheetos for a final flourish. More yoghurt, chutneys and the crunchy toppings can be served alongside for the Nostalgic NRIs to add as their palates desire. 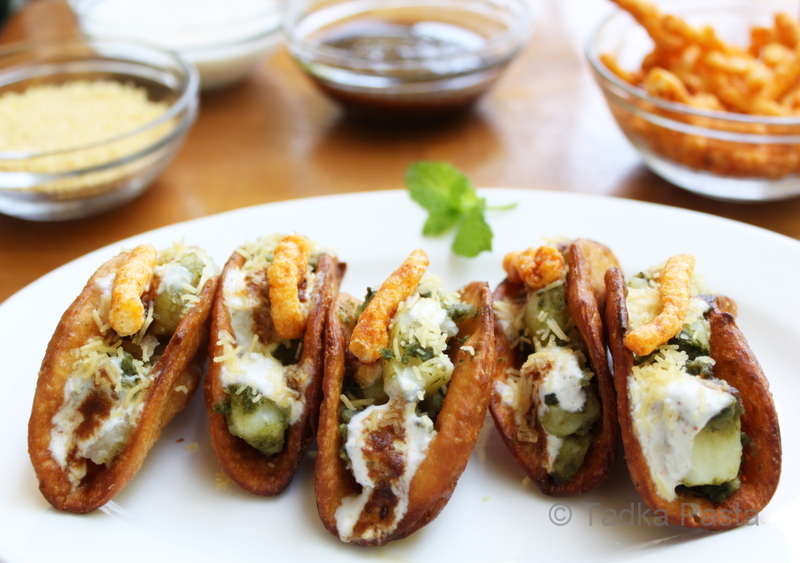 This entry was posted in Appetizer Alley, Funnibles, Snack Attack and tagged aloo chaat, appetizer, basket chaat, chaat, Dahi, deep fry tortilla, easy, flour tortilla, how to make papdi, katori chaat, kid-friendly, kurkure, papdi, papdi from tortilla, puri, quick, sev, spicy, tokri chaat, vegetarian. Bookmark the permalink. Fusion food heaven! What a BRILLIANT idea ! Thanks, aipi! So glad that you liked it. The two magic words, potato and chutney sold me. There are two many words, in your commentary, I don’t understand but in time, I am going to learn more. Most humbled and thanks so very much for the kind words! Keep coming by! Neat idea .. looks yummy. The pleasure’s ours, thanks, Vatsala for coming by! Please do and come back to tell us how you liked it! Thanks, Shuchi, for coming by! 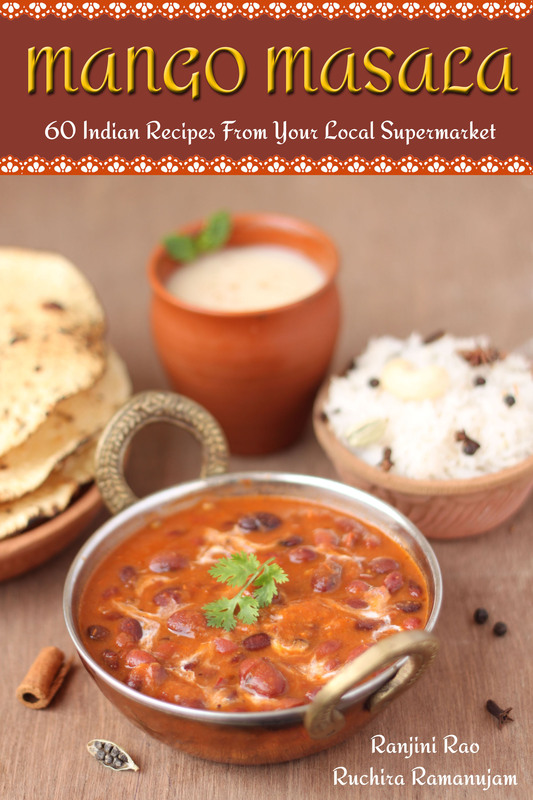 U have a nice blog with good recipes as well……..will keep a look out 4 ur next post as well. Thanks so much for the kind words! We hope we live upto that! Woo what a twist!! 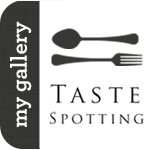 love your Desi style chalupa..& lovely click dear.Thanks for sending your entry to my event. Our pleasure, and thanks for the kind words, Saras!